This January, the Deliciously Ella team are expanding their entirely plant-based and vegan friendly offering at their London delis! A brand new breakfast selection with new smoothie bowls, acai bowls, smashed avocado, homemade beans on toasted sourdough and delicious porridges. with two flavours available: Original and Ginger. 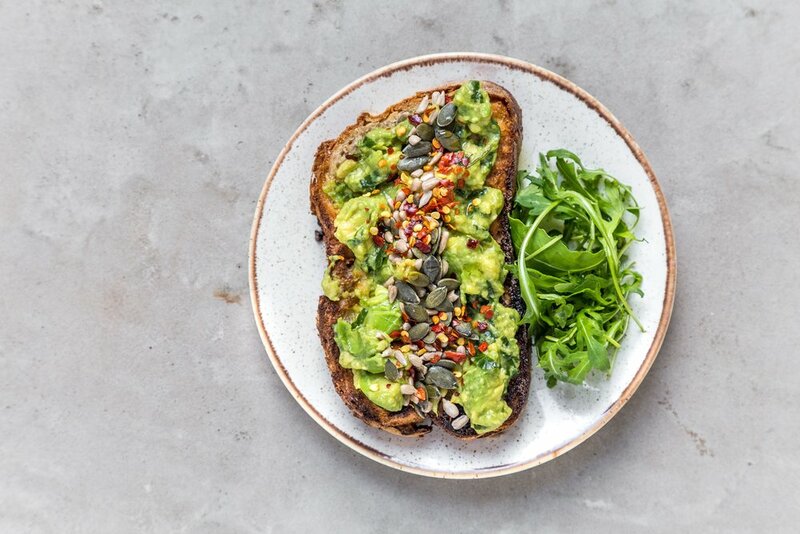 New smashed avocado on sourdough toast with mixed seeds, chilli & rocket. PB&J Bagel: a toasted gluten-free sourdough bagel with lashings of peanut butter and covered in sweet raspberry chia jam. ‘Build your own’ breakfast bar. Two new Smoothie Bowls at Seymour Place: an ‘ Acai Bowl’, made with acai, banana, blueberries and almond milk, topped with Original Granola, peanut butter and sliced banana, and an energising ‘Green Smoothie Bowl’ with spinach, banana, strawberries and coconut milk, topped with Nutty Granola, coconut chips and dried strawberries. The ‘ Golden Roots Juice’: carrot, apple, lemon, ginger, turmeric. The ‘ Fiery Ginger Shot’: ginger, turmeric, apple, lemon, cayenne. The ‘ Smooth Ginger Shot’: ginger, lemon, apple. signature Sweetcorn Fritters with smashed avocado and spiced baked beans. Smoothie Bowls are so great, and I love our new PB&J bagel."